There’s a quick and easy way to check if you’re browsing securely. Look for the green padlock in the address bar, on the left from the website’s address. If it’s there, this means that your connection has been secured and you can be sure which website you’re visiting. It’s important to make sure the websites you visit are safe when it comes to banking or shopping online, where you have to input personal details such as your bank-card number. Opera’s fraud and malware protection also helps identify known malicious websites. You will be warned if a website tries to defraud you, steal your password, or install a virus. If you want extra security measures, there are extensions for Opera for computers that check the sites you visit. 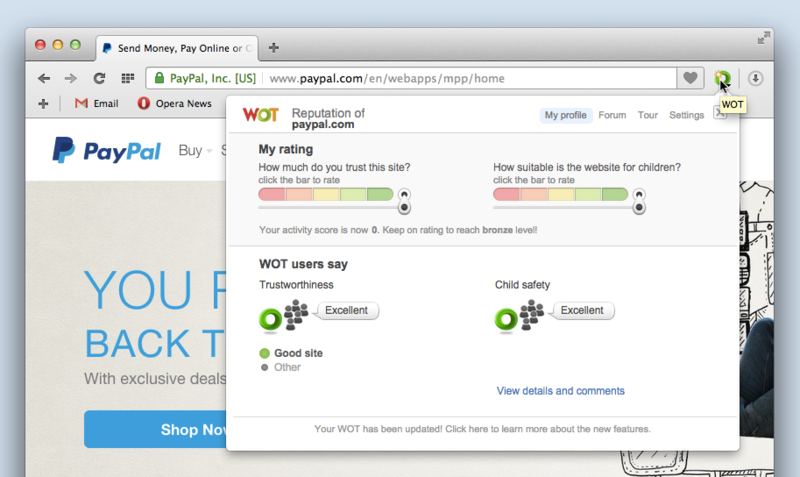 WOT, for example, gives you a security overview of websites. A green light means you’re browsing securely, while red means many users have given the site bad reviews for security. Try Opera for computers today and browse securely!